Ikamva Labantu is a South African organization dedicated to advancing community development and individual livelihoods in Cape Town’s townships, developing solutions by South Africans for South Africans, building step by step, and person by person. 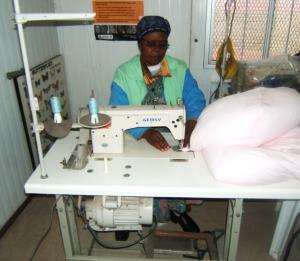 Among their artisan participants is Thabisa, who lives in Guguletu and contracted polio at age two. As her family’s sole provider, she depends on her Community Creations salary to support her and her brother’s four children. Another community member, Mavis, has been hearing impaired since the age of four and is the only breadwinner in her large extended family. Lungile also contracted polio at a young age and is dependent on removal prosthesis and crutches to be mobile. He is responsible for overseeing production and quality control. According to his co-workers, Lungile is the one who keeps everyone smiling.